Spring has finally sprung and not a moment too soon! I’m sure you guys have been busy lil bees crafting all winter and I thought it might be fun to share some projects for Spring. A great big THANK YOU to the Ladies who came up with these super projects for allowing me to share them. Please go visit their pages and show them some love. Btw…Interweave’s April Kits are here! Valid for this month or while supplies last. This pretty, feminine crochet shawl pattern features the shell stitch for the edging. Are you hosting brunch on Easter? 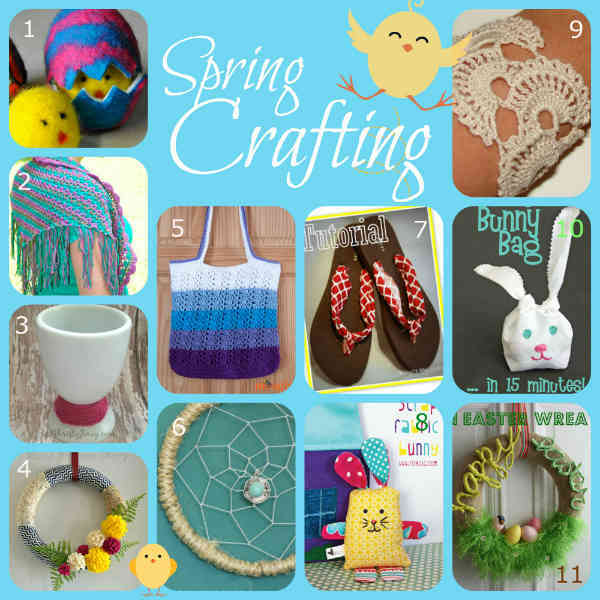 Pretty up your table by decorating egg cups with yarn…. a different color for each guest! Welcome your guests with a bright and cheerful spring wreath! Free crochet pattern for this cute tote bag. Looks like a perfect bag for the beach to me! Don’t you just love dream catchers? This is going on my to-do list. Nothing screams spring like a cute pair of flip flops! Dress up the cheapy dollar store sandals with some pretty fabric! How cute is this little bunny? And pretty easy to put together as well. Super easy, super fast and totally cute candy bag that looks like an easter bunny! An finally, a bright and cheerful wreath just in time for Easter! Want more fun crafty projects? Check out these books on fabric crafts and thrift store fun. Thanks for sharing my Fabric Flip Flops. This is a great collection and I am honored to be a part of it. You’re welcome. I’m going to dress up my flip flops! oh super awesome round up! !